God empowered both of them to perform miracles, including bringing several dead persons back to life. The question raised was why neither Elijah or Elisha were hailed as the Savior of the world the way Jesus would be by some people about nine centuries later. Here are a few possible answers that cross my mind. First: Both Elijah and Elisha lived before anyone really considered the possibility of a Messiah. The two prophets lived in the northern kingdom of an Israel that had fractured in two after the death of King Solomon. The north, which took for itself the name of Israel, was mired in idolatry and arrogance while enjoying relative prosperity and stability. They weren't looking for redemption from Israel's God. Second: Even if the people of the northern kingdom had had hopes for a Messiah, chances are that they would have been just as wary to see Elijah or Elisha in that role as the people of Judea (and their Roman overlords) were to see Jesus as Messiah eight centuries later. A Messiah/Savior rightly demands on our lives that we, as self-centered people, prefer not to meet. That's one big reason that many people spurn Jesus to this day. Third: Neither Elijah nor Elisha ever made the same claims for themselves that Jesus made for Himself. In John 10:30, for example, Jesus flat out says, "The Father and I are one." Earlier in John's gospel, He tells some of His fellow Jews in a grammatically awkward phrase, "Before the Father was, I AM." "I AM," ego eimi in the Greek of the New Testament, translates the Hebrew noun and verb that Israel's God gave to Moses as His Name at the burning bush, Yahweh. Jesus claims to be God in human flesh. From any other person, even miracle workers like Elijah and Elisha, this claim would be blasphemous. And it was on the charge of being a blasphemer that the Jewish religious leaders of His day sought Jesus' execution. But Elijah and Elisha claimed simply to be prophets, people who go before others to tell them (and show them) the Word of God. *Go here and type in 1 Kings, chapter 1 [1 Kings 1], if you want to see what we've been reading lately. Then, keep following the arrows leading you to the next chapters. 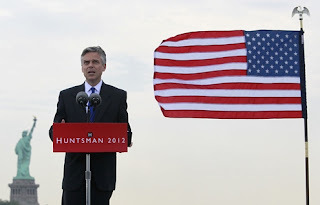 "I am but a stranger here..."
Jon Huntsman, a guy with an impressive resume, announced on Tuesday that he is running for the 2012 Republican presidential nomination. Whether the former governor of Utah and ambassador to China stands a chance is only a guess. But, if you believe that civility should infuse the process by which we elect a president in the United States, his announcement speech ought to bring some encouragement. He and I have a difference of opinion on how to help a country we both love. But the question each of us wants the voters to answer is who will be the better president, not who’s the better American. Both Democrats and Republicans, in their ways, tend to question the patriotism and the love for the Constitution of their opposition. Patriotism, contrary to Samuel Johnson, is only the second-to-last refuge of scoundrels. Their last refuge is loudly and incessantly accusing political opponents of lacking patriotism. All this mutual demonizing obscures the fact that there are patriotic Americans on both sides of the partisan kabuki dance. Kudos to Huntsman for refusing to play the "I'm-more-patriotic-than-you-are" card. Yesterday afternoon, I was stoked about pulling into the drive-through line at our local McDonald's. I was going to buy some bottled water. No! It wasn't the water that I was excited about. I got into line mainly to use our congregation's new "This Meal's on Us!" card. I was going to pay for my bottled water and also pay for the order of whoever was ordering in the car behind me, then ask the cashier to give the card to that person. The card would explain why some stranger had just paid for their order. Each "This Meal's on Us!" card tells the recipient that God loves them, no strings attached, and that Saint Matthew Lutheran Church stands ready to serve them in other ways in which they might need help. I ordered my bottle of water, pulled up to the pay window, explained to the cashier what I was doing, and handed her both my credit card and the "This Meal's on Us!" card. The cashier processed the two transactions and gave the receipts to me. I saw mine; a buck-fifty for my water. Then I looked at the receipt of the next car. The person had ordered an iced-tea from the dollar menu! At that rate, I was tempted to drive through three or four more times. But I had a shut-in to visit. I'd sort of hoped, for my first personal kindness outreach in a while, to pay for an order that included about fifty Big Macs. You know, some stunner that would cause a tapped-out agnositc construction worker who'd been drafted to pick up burgers for the whole crew to break out into the Hallelujah Chorus. But instead, God put a person in the line behind me who only wanted an iced tea from the dollar menu. It was a humbling reminder that we don't undertake acts of kindness in Jesus' Name to get goose-bumpy thrills for ourselves. We do them to share Jesus in the ways God determines to be necessary at the time. Then, we leave what happens as a result in the hands of God's Holy Spirit. As my buddy, Pastor Steve Sjogren likes to say, "Small things done with great love will change the world." I'm learning to trust that God will use the small acts of faithfulness we do to bring positive changes to the world, one person--even one iced tea--at a time. Meanwhile, as He puts me gently in place for my grandiose visions, I have to smile. God has a sense of humor. Right now, members of Saint Matthew Lutheran Church in Logan, Ohio, and I are reading the Bible together in a year's time. We're reading it straight through, about three chapters a day, from Genesis to Revelation. Here are a few thoughts underscoring the importance of constant study of Scripture that I've run across in the past few days. We cant watch TV for 3 hrs then read the Bible for 3 min & expect to grow spiritually. I want to put a particularly strong emphasis on this step of the Radical Experiment [reading the Bible through in a year's time]. The Christian marketplace is filled with books today--some of them healthy, and some of them not so healthy. To be honest, I have been very hesitant to write this book, because I look at our bookstores and think, Do we really need another one? I suppose only time will tell if it was worth it, but time has already spoken on one Book. God has chosen by his matchless grace to give us revelation of himself in his Word. It is the only Book that he has promised to bless by his Spirit to transform you and me in the image of Jesus Christ. It is the only Book that he has promised to use to bring our hearts, our minds, and our lives in alignment with him. I'm not saying that God has not used or blessed other Christian books throughout Christian history, but there is only one Book that he has perfectly inspired by his Spirit for the accomplishment of his purpose. When you or I open the Bible, we are beholding the very words of God--words that have supernatural power to redeem, renew, refresh, and restore our lives to what he created them to be. Of course, there are passages of Scripture that trouble us or that we can't explain. But as you read the Bible daily, great themes of faith emerge, themes that will bring your faith and your relationship to God alive. The daily reading of Scripture will move your relationship with the God ultimately revealed to the whole world in Jesus Christ to a ever-deepening level of intimacy, dependence, true awe of God, and true confidence in your living. And, as with any relationship of love, the key is not some chimerical entity people call "quality time," it's quantity time. If we don't spend lots of time with God--in things like daily Bible reading and study, daily prayer, regular service in His Name--along with weekly group Bible studies and weekly worship, our relationship with God can only be superficial. If you want more than a superficial faith or a superficial understanding of God, you can begin to address that desire by reading the Bible every single day. extol him, all you peoples. and the faithfulness of the LORD endures forever. 1Praise the LORD, all you nations! Extol him, all you peoples! The word from the Psalm's original Hebrew translated by the italicized phrases above, is a form of the Hebrew word, hesed. It specifically refers to God's covenantal faithfulness. The word means that God will not break the promises He makes in His covenants. A covenant is a compact or agreement. In Old Testament times, covenants were made (or cut) by conquering kings with their subject peoples. "I will be your king," a covenant might begin. "I will protect you from violence and thievery. In response to this, you will pay taxes, obey the laws, and be subject to service to the king." Israel's God--YAHWEH, I AM--made a covenant with Israel. You see it embodied in the Ten Commandments, which begin, not with commands, but with a promise. "I am the LORD your God, who brought you out of the land of Egypt, out the house of slavery..." (Exodus 20:3). Before issuing a single command of His moral law (valid today and for all time, by the way), God promised to be the God, Lord, and Protector of His people. It's only after issuing this promise that He says, in effect, "In response to this gift of grace, I expect you to fulfill the following commandments." The one who believes and is baptized will be saved; but the one who does not believe will be condemned. As was true in Old Testament times, when the patriarch Abraham believed in God's promises and God counted him righteous--right with God, free from the debt of sin which would have otherwise have cost him his life for eternity, under God's new covenant, those who believe (or trust) in Jesus, God-in-human-flesh, are forgiven their sins and freed from death in order to live with God eternally. “For God so loved the world that he gave his only Son, so that everyone who believes in him may not perish but may have eternal life. Indeed, God did not send the Son into the world to condemn the world, but in order that the world might be saved through him. Those who believe in him are not condemned; but those who do not believe are condemned already, because they have not believed in the name of the only Son of God." This is the kind of love--hesed love, covenantal love--that Psalm 117 talks about. "I have done this for you (in ancient Israel's case, the this was deliverance from slavery in Egypt, in Jesus' case, the this is deliverance from slavery to sin and death), now entrust your life to me. This is what God's love is like. It's love that calls people away from the sins that will kill them, back to the only one who can give them life. It's not sentimental love. It's not mushy love. It's not about feelings. It's about life and death. Accepting this love and Christ's authority over your life brings life. Rejecting Christ's love and authority spells death. God loves sinners and hates our sins. He wants to love us back into relationship with Him. But if we choose our sins over God, if we refuse to turn to Him, God is one king who will not force us to obey. But He will not force us to come to Him. The message of the Bible is simple: Come to the God made plain to all the world in Jesus Christ. Turn from sin and trust in Him each day. Let God's covenant love change your life and your eternity. So, There's a Holy Trinity...What's That Got to Do with Me? I was about eight years old and I had a question. The first person to whom I posed it was my Mom. When I asked, she stammered. She probably hadn’t expected me to ask the question I asked at such a young age. And so, she told me that I should take my question elsewhere, not to my Dad, but to our pastor at the time, Reverend Blackburn. I hope to answer that question. But before I do, I should explain a little about the Trinity. The word “Trinity” is never used in the Bible. But repeatedly, by inference in the Old Testament and in plain words in the New Testament, the Bible affirms that three persons—Father, Son, and Holy Spirit—are co-equal, co-eternal personalities of the one and only God the universe. We see the footprints of what the theologians call God’s “triune nature" in three of our Bible lessons for today. In our second lesson, which is from 2 Corinthians, the apostle Paul tells the squabbling Christians in the Greek city of Corinth to live out a commitment to what’s best for one another. Live in peace, he tells them, and then he invokes the three Persons of the one God when He says, “The grace of the Lord Jesus Christ, the love of God, and the communion of the Holy Spirit be with all of you.” In this phrase, Paul puts the three persons of the Trinity on a par with one another, all one God, three persons. Then, there’s our Gospel lesson, from Matthew. It recounts how Jesus gave the eleven apostles what we call “the Great Commission." Jesus told them and us to teach the whole world about Him and the new life He brings to repentant sinners who believe in Him. Then, Jesus says, we are to baptize, “in the Name of the Father, and of the Son, and of the Holy Spirit,” putting both Himself and the Holy Spirit Who on an equal footing with the Father. Let me suggest three ways it may make a difference to you and me as we go through our daily lives. Ann and I had been married about five-and-a-half years when my father offered the only piece of advice I remember him ever giving to me. Dad and I were alone when he asked me, "Are you and Ann ever going to have children?" I gave an intelligent reply: "I uh...We uh..." Dad said, "If you're waiting for the perfect time to have kids, the time will never come. You'll never be able to afford them." Then, this man who's the father of five gave his closing argument for having children. Do you know what he said? "Mark, there are no good reasons for having kids. Have them anyway." There are lots of things we do that aren't really necessary. Having children is among them. So are creating art or music. So are starting a business, going on mission trips, telling someone about Jesus, perpetrating an act of kindness just to let them know that God loves them, no strings attached, or building a better mousetrap. There are so many things we do that we don't have to do. But the desire to express ourselves or to give our love away is so powerful that we feel compelled to do the most extravagantly unnecessary things. This fact about we human beings, I think, is one way in which we reflect the presence of the image of God in us. The Trinity makes a difference in our daily lives, first of all, because in the Three-in-One-God, we see overflowing extravagance of God's love! God gives us His love at least three times over! God didn't have to create the universe or give us life. But He did. God didn’t have to take on human flesh to die and rise for us. But He did. God doesn’t have to reach out to us as He does today through His Holy Spirit, Who creates and nurtures the Church, inspired the Scriptures, and is still inspiring believers today. But He does. God enjoyed completeness without us. But the Three-in-One-God wants us, wants us today, wants us for all eternity! The Holy Trinity, this big, full God, cares about you. He’s invested Himself in all His fullness, in you and in your future. God does that over and over again. In the Trinity, God demonstrates, underscores, and underlines that you, your every moment, your every decision matters to God! That’s the first way in which knowing the Three-in-One-God makes a difference in our lives. We often think of the agony Jesus experienced on the cross, especially as He cries out, “My God, My God, why have You forsaken Me?” But we don't often consider the agonies of the Father and the Spirit as they watched the Son bear the sins of the world. If you’ve ever been a parent who listened to a child cry over homework that seemed too hard, homework it would be easier for you to do for them, but which you know they must do themselves, you know the Father felt agony as Jesus completed His earthly mission on the cross. If you’ve ever been a parent or a sibling or a relative of someone addicted to drugs and alcohol, knowing that their agony would go away for a moment if you slipped them the money they needed to buy the dope or if you gave them a drink, but for their good, you refused, then you know how the Spirit felt as He groaned in sighs too deep for words at the sight of Jesus in His death throes on the cross. If you've ever spent days or weeks with loved ones as they lay suspended between life and death, you know what both the Father and the Spirit went through as Jesus hung on the cross. These agonies the Trinity endured for you and me. And when the Spirit comes to us in Baptism, He brings God's compassion for us in all that comes to us in life. The Spirit comes to fiercely protect us from a life alone, compassionately placing us in the community of the Church, a spiritual family that allows us to experience something like the connectedness enjoyed by the Father, Son, and Spirit. In the Trinity, God stands with us in our joys and in our sorrows, in everything that we go through. We know this because the Trinity was there together on the cross, sharing our life so that we can share life with God forever. So the Trinity makes a difference by assuring us that we matter to God and that God stands by us always: Jesus says this is so to the close of the age. Now, here’s a third way the Trinity makes a difference in our everyday lives: He draws us into community with Him. God in His fullness, Who cares about us even though He doesn’t have to, Who is able to stand with us in every experience, also makes it possible for us to experience fellowship, community, with Him and with His family, the Church. that He wants us to live in constant relationship with Him. When I look at your heavens, the work of your fingers, the moon and the stars that you have established; what are human beings that you are mindful of them, mortals that you care for them? Like the psalmist, we might well wonder why a God so big and so great would bother with us, too. But the God revealed as Father, Son, and Holy Spirit shows us that He does care for us. More than we could ever imagine.